About.me was one of the very first services which made it easy to create a landing page for users online, featuring links to all of your social profiles. We have since seen a whole slew of similar services catering to niche markets. There’s Nogen0 for musicians, Central.ly, AboutOurWork and JustAbout.co for businesses. Re.vu adds a new dimension, by allowing you to add a CV, import details from LinkedIn, and create an infographic representing your career, milestones, online presence and more.While we’ve taken a look at a Visualize.me, which offers a similar service using your LinkedIn data, Re.vu allows you to add more data manually. The first thing you’ll want to do when you sign up for a Re.vu account is import your LinkedIn information, after which you can start to manually add the additional details you want to share with prospective employers. 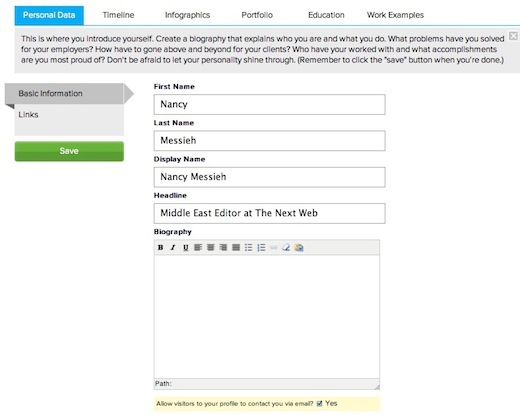 You can add a biography, upload your traditional CV and add a profile photo. You can also add links to your personal blogs, sites and online accounts including Twitter, Facebook, Google+, Flickr and more. If you’ve already imported your LinkedIn details, your timeline will automatically be populated with your career history. If you’d rather not connect to LinkedIn, you can add these details manually. The next step is to add details to flesh out your infographic. You can include your achievements, job duties, skill evolution, skill proficiencies, quotes about you, your pastimes and more. This is a feature that really sets Re.vu apart from other similar services. It makes it easy for the user to create quantifiable achievements that can be viewed at a glance, allowing you to highlight the exact things you want your prospective employer to know about you. If you’re a visual artist, you can add your own work or images to the portfolio section of your profile. Supported file types include PNG, JPG and GIF. Writers can skip over to the Work Examples section and upload samples of their writing in PDF, DOC, DOCX, ODT and even PPT format. You will have to upload photos or documents one by one, but considering that you only want to showcase the best of your work, that is only a minor inconvenience. After you’ve added in all of your details, you can view your profile to edit the design. There are 12 themes to choose from, which allow you to change the fonts, colours and background image at the click of a button. The only feature you can customize individually is changing the background image. The ability to select the font and theme colours yourself is a feature that is sorely lacking from the service. Once you’ve got your profile up and running, you can send it out to prospective employers, and can keep track of who’s checking out your online CV. Re.vu provides basic analytics, with more advanced features on their way. For the time being, you can tell how many times your profile has been viewed, see the average visit length, and how many times your traditional CV has been downloaded. Re.vu is a great tool for freelance writers, designers and photographers who want to showcase their work, or can also be the ideal accompaniment for someone who is looking for a job in a forward thinking company, that will be willing to veer away from the traditional CV. This past year has seen people get pretty creative with their job applications and Re.vu makes it easier than ever for those of us who don’t have the know-how or the resources to get in on the action.